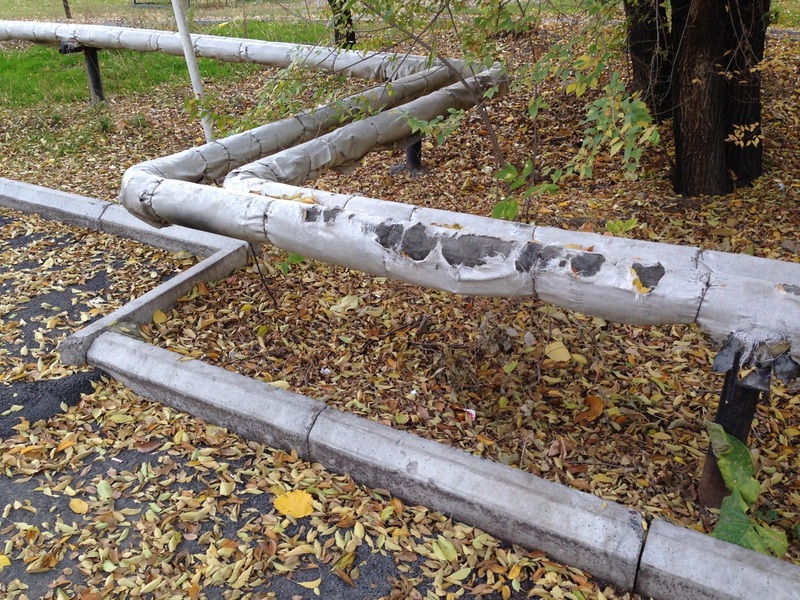 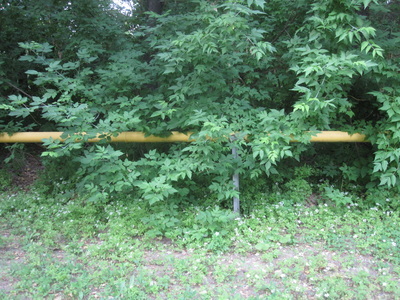 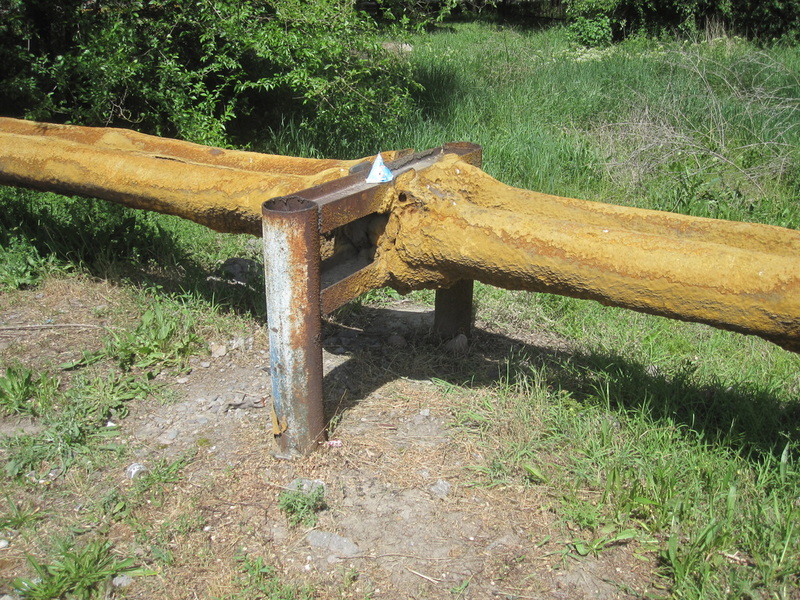 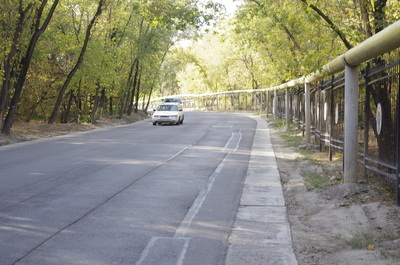 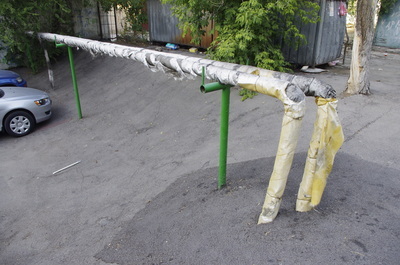 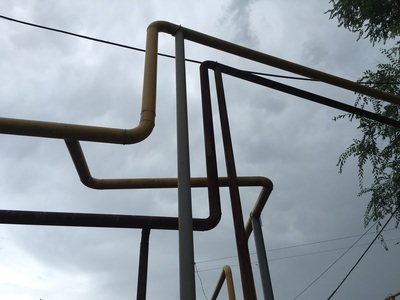 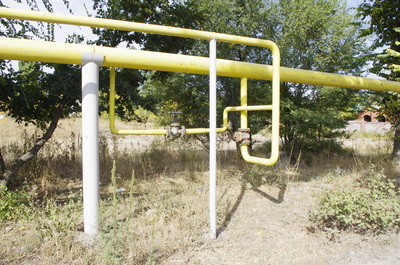 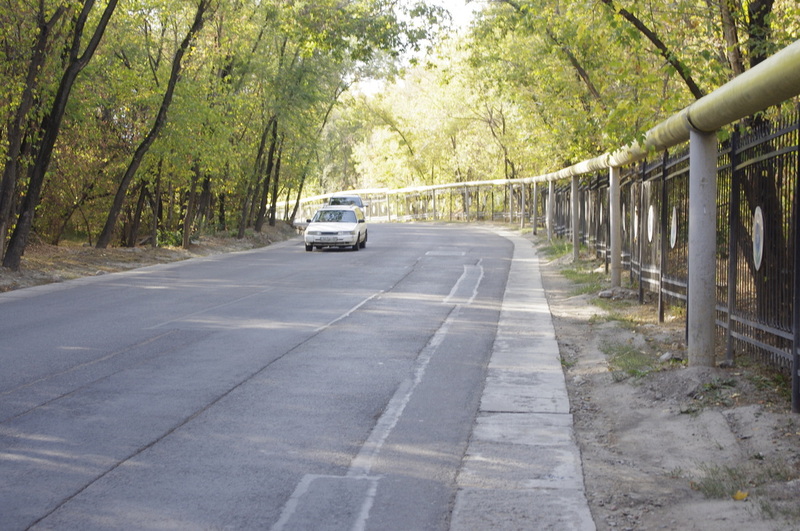 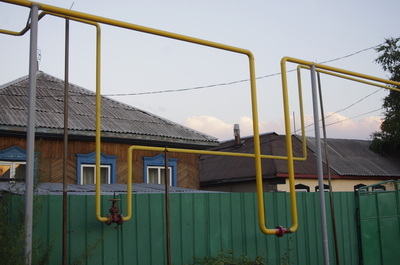 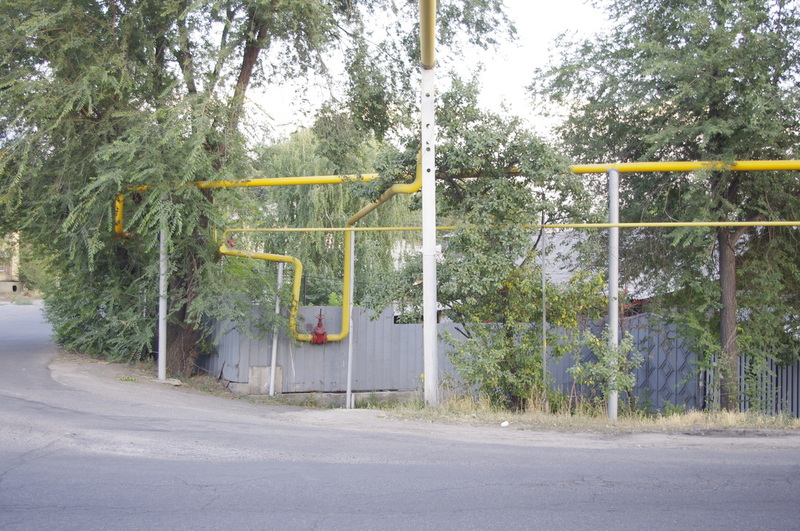 Above-ground distribution pipelines for natural gas are a common sight in town, and visitors often ask about their safety: Isn't it a bit sketchy to have pipes full of flammable gas on the sides of so many roads, like ghetto guard rails? 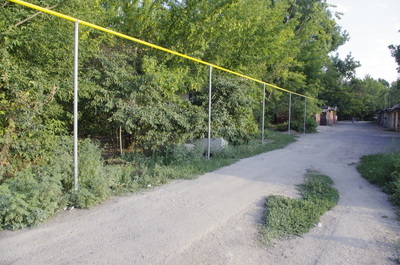 The price of undergrounding these lines must be somehow prohibitive, or maybe the city doesn't have the adequate rights to dig everything up. 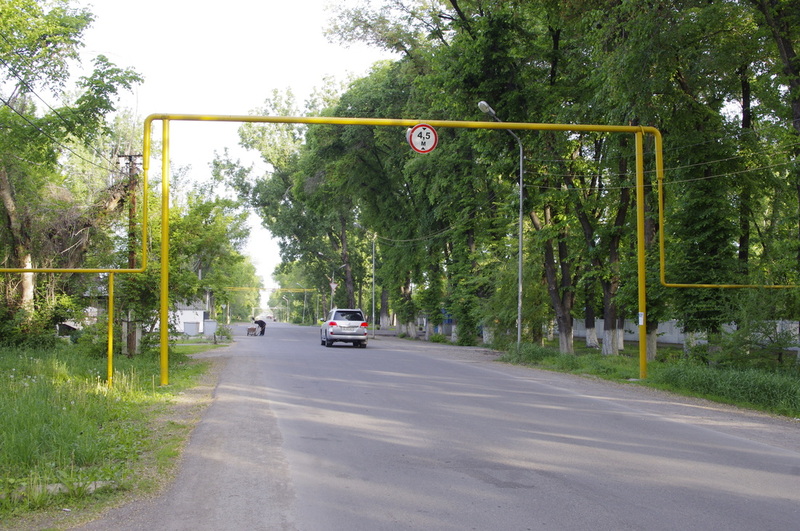 Instead, the yellow lines cross streets looking like giant exercise bars or very un-regal arches, signs posted with the height of the pipe so that taller trucks don't smash through them. 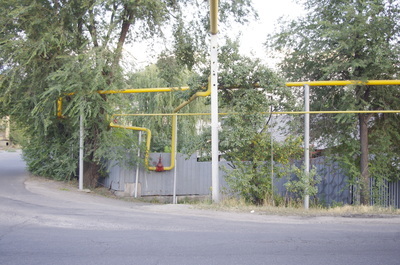 There are similar accommodations at driveways, where the pipes running along the sidewalk jump up over gates and drop back down again. 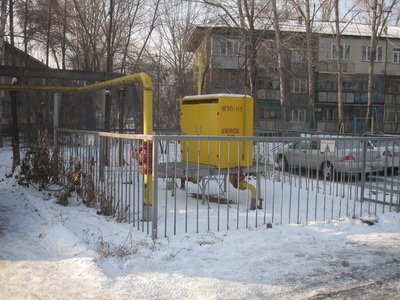 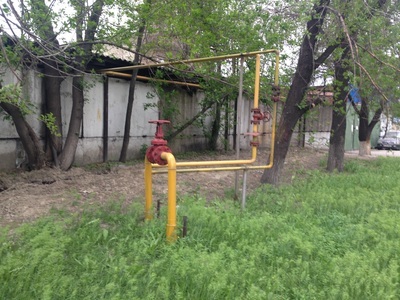 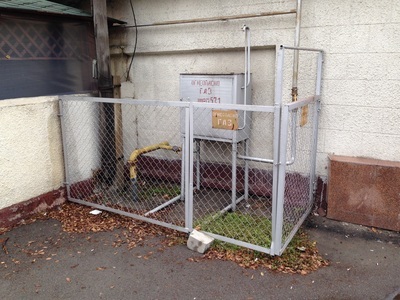 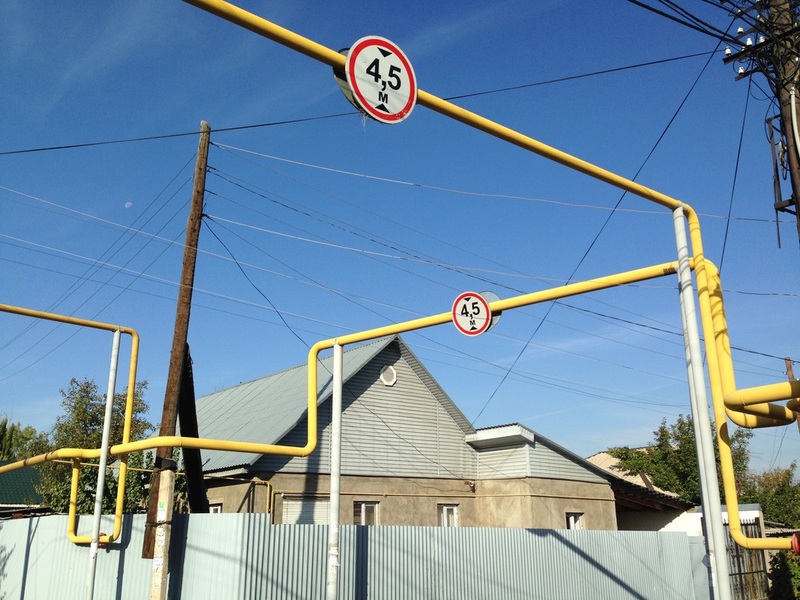 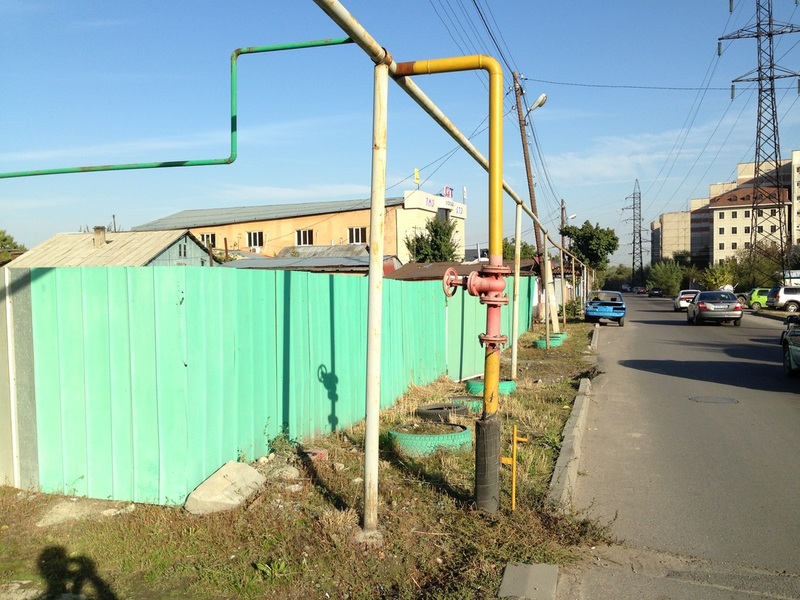 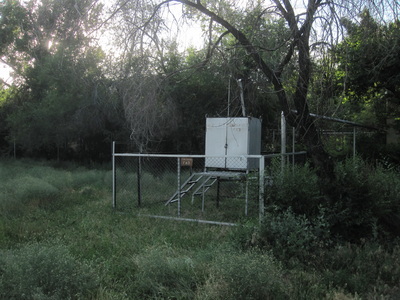 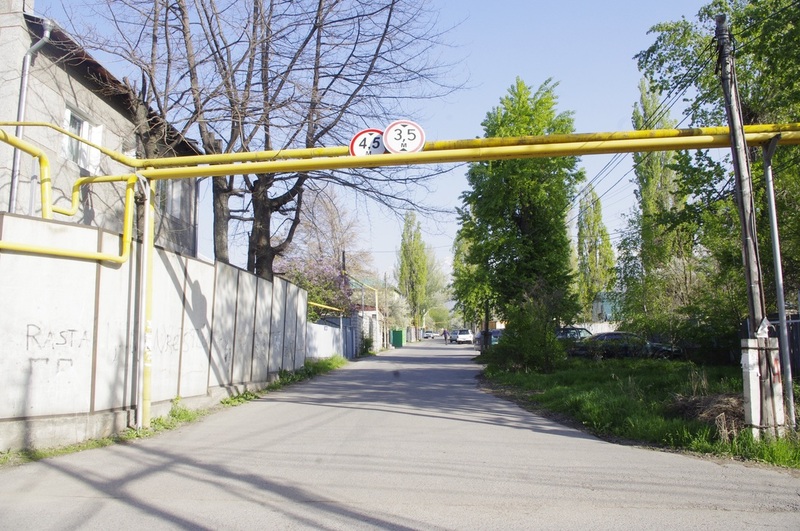 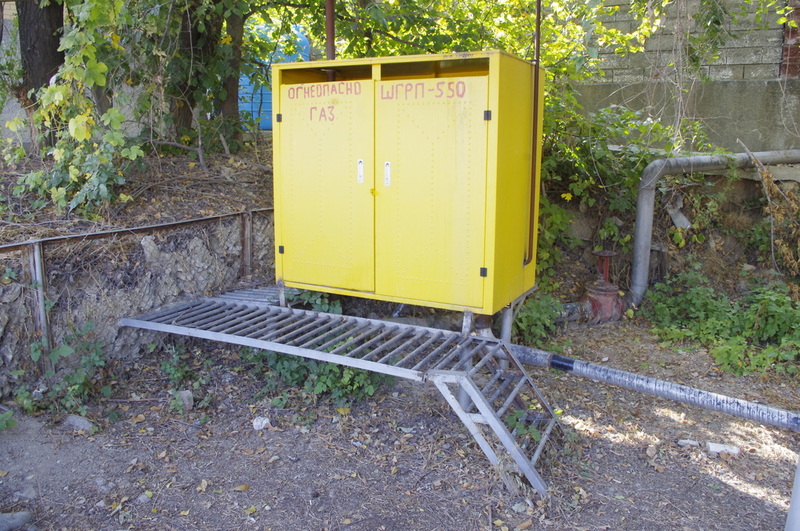 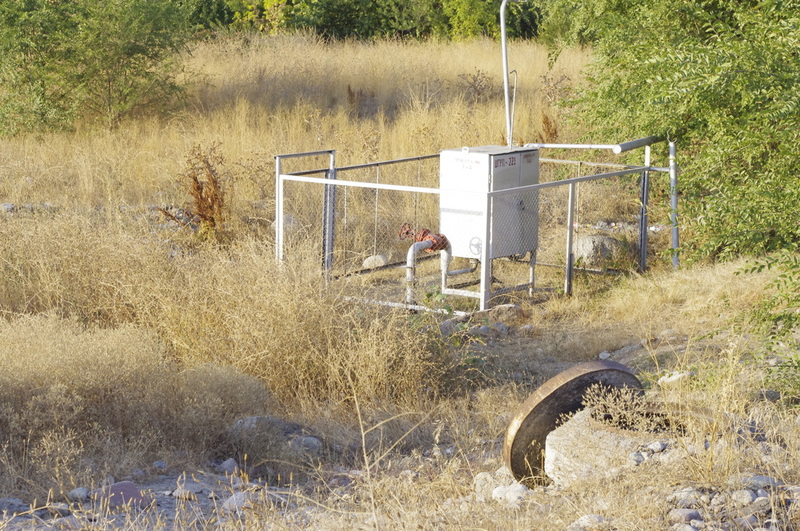 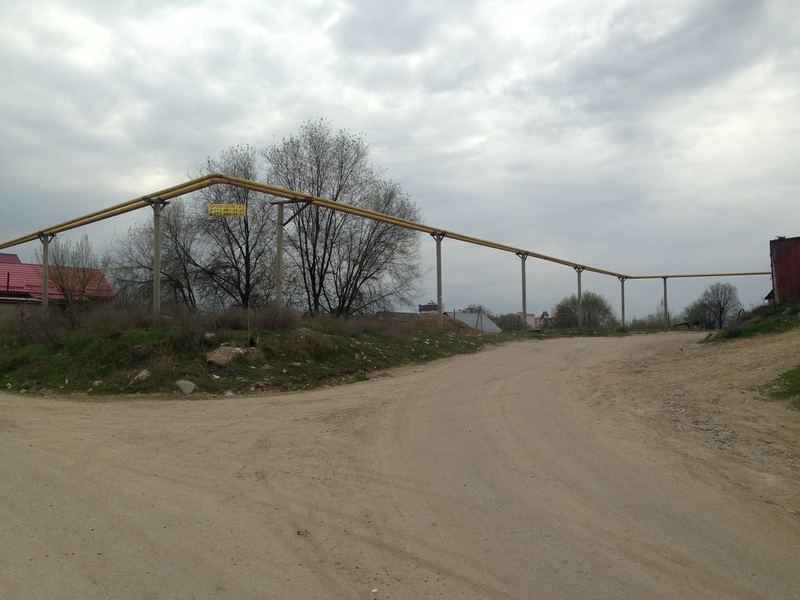 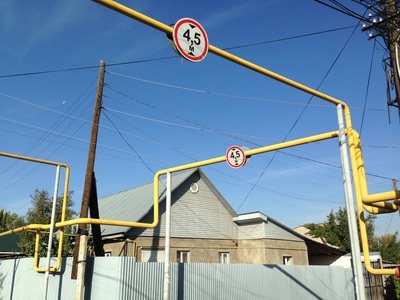 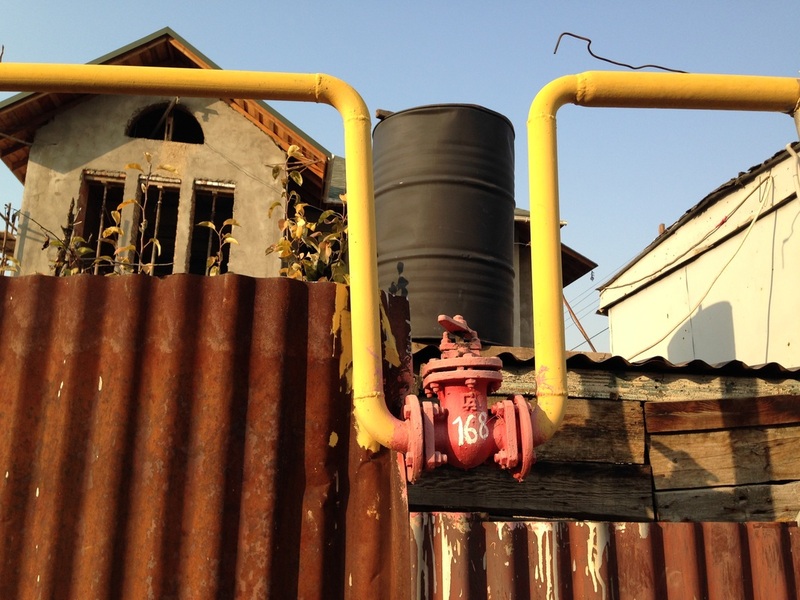 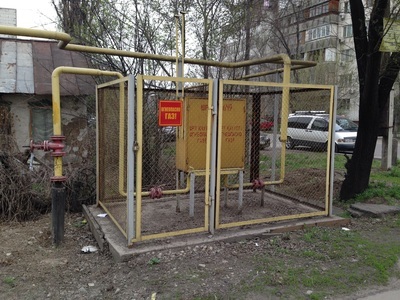 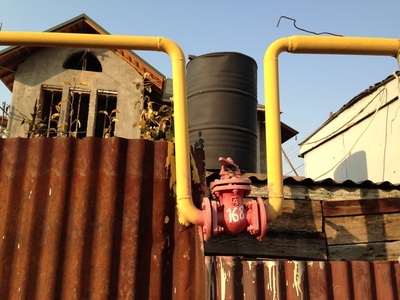 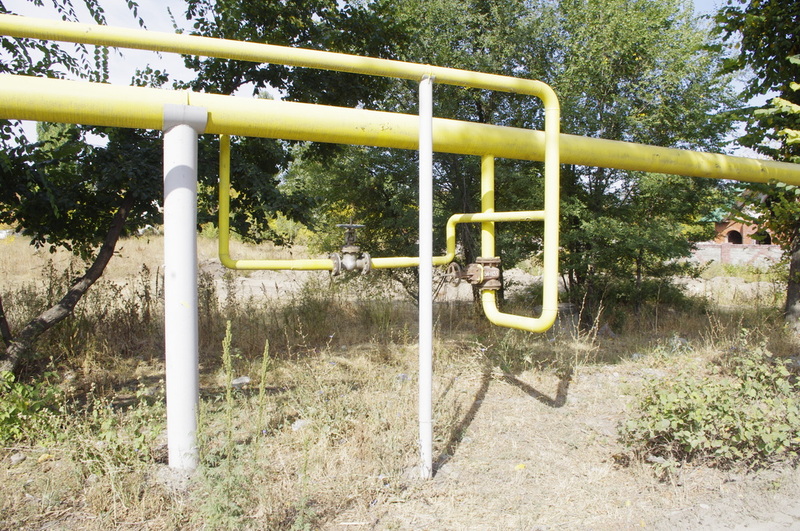 Along the route of this gas distribution network, you can find caged-in metal boxes with signs that say "Danger! Gas!". 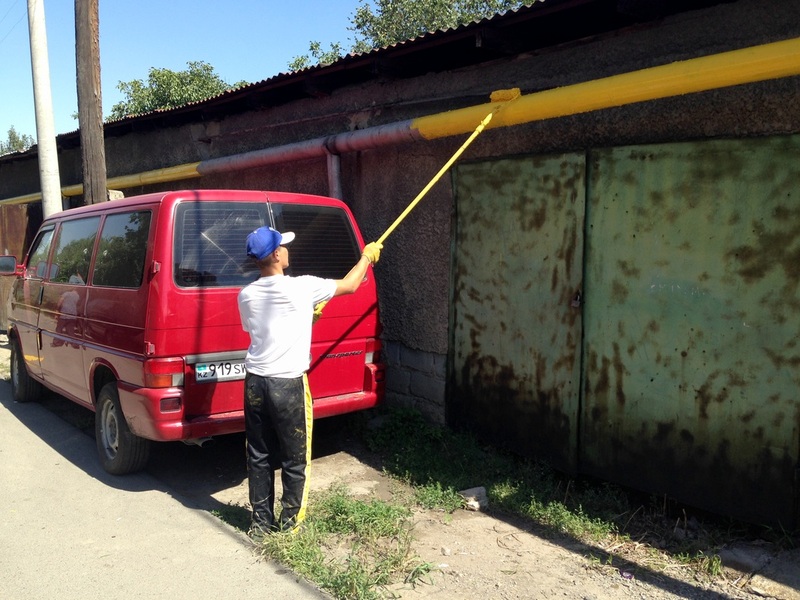 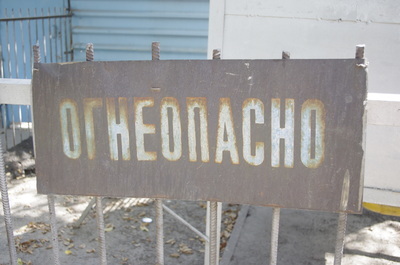 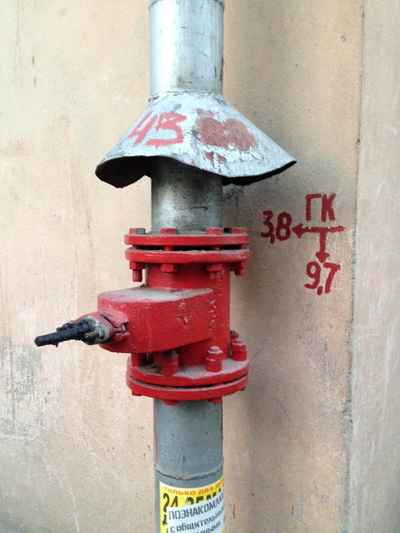 If you look at the spray painted labels on the boxes, you will see the letters ШГРП, or ShGRP, which stands for Шкафные Газорегуляторные Пункты, or Shkafnye Gazoregulyatornye Punkty. 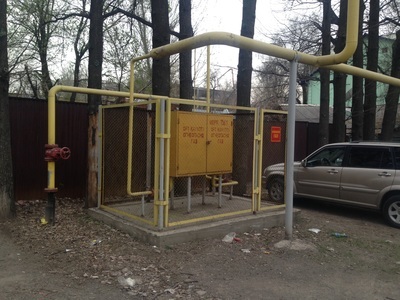 A direct translation would be "Cabinet-type Gas Control Point", but in English-speaking gas industries these are called "regulators". As gas travels from the big transportation pipelines to consumers, it doesn't somehow trickle downhill. 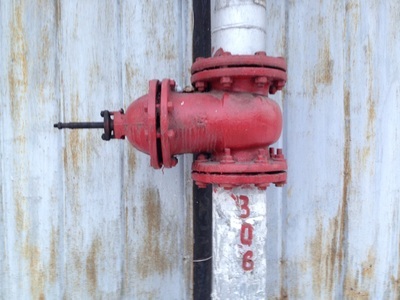 Rather, it is moved along by differences in pressure. 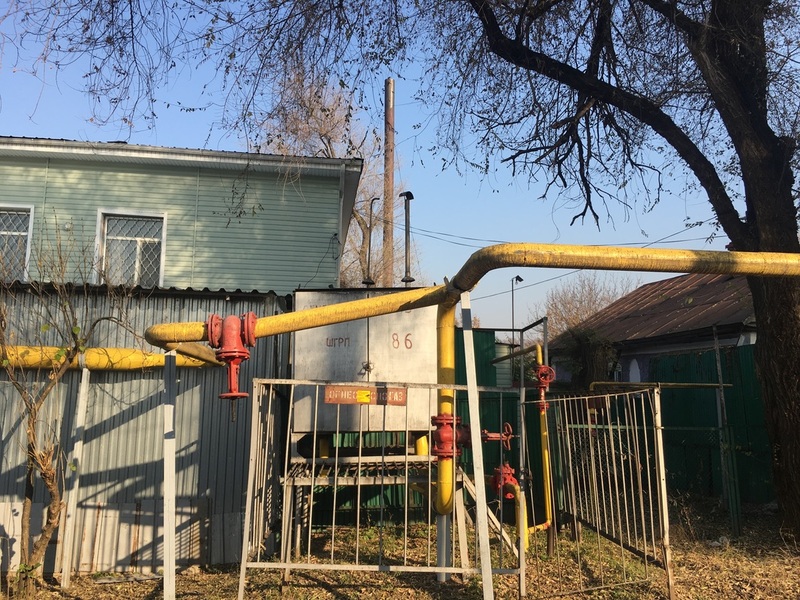 By the time gas gets to residential neighborhoods, it must be at a lower pressure anyway, so these mysterious boxes slow down its flow and prepares the stuff for its final journey to your home. 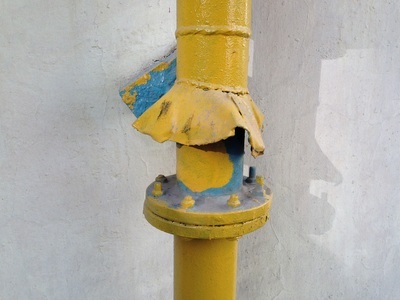 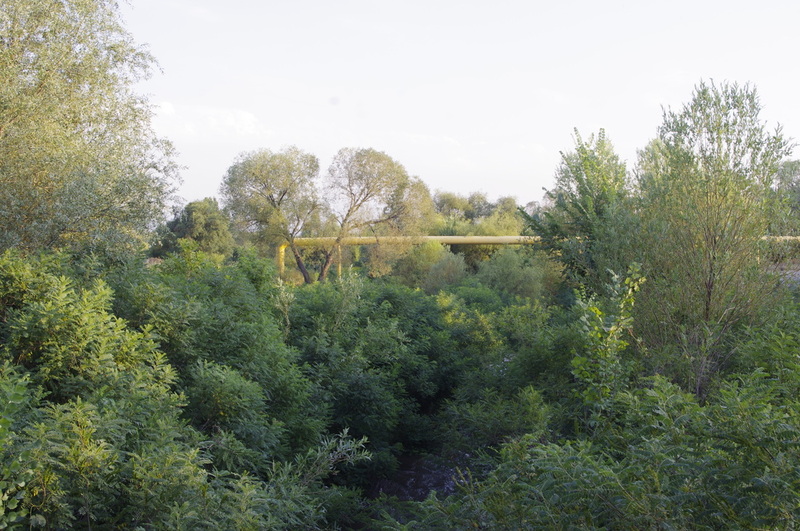 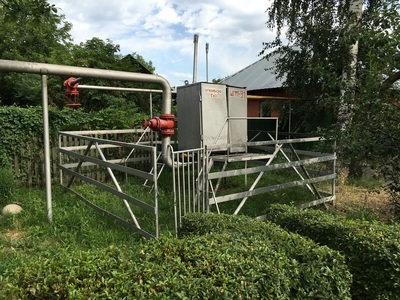 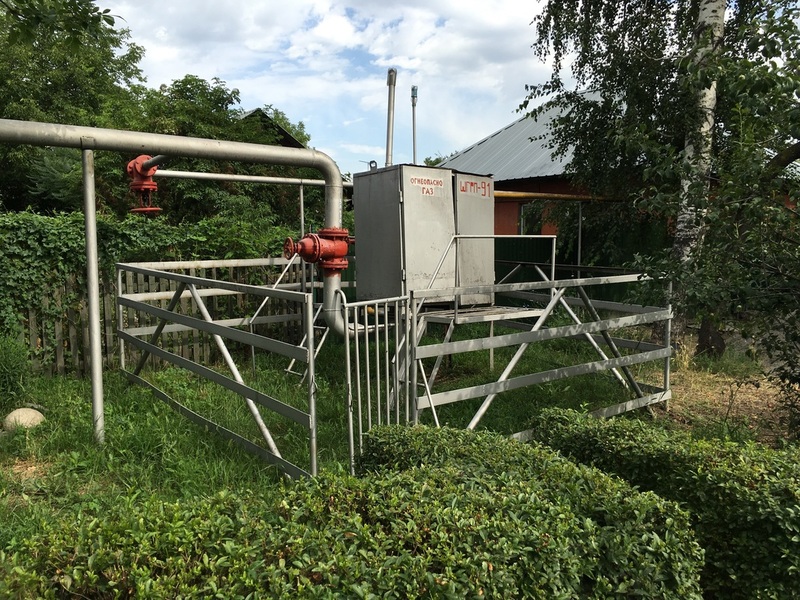 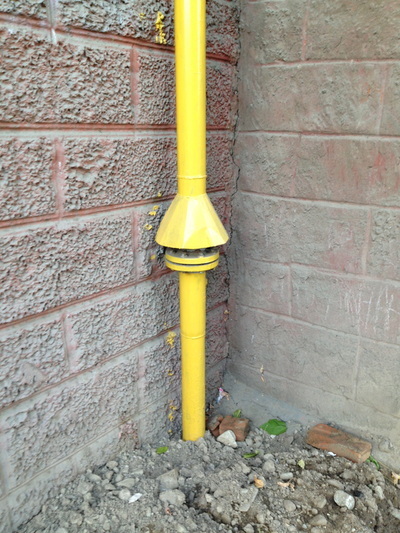 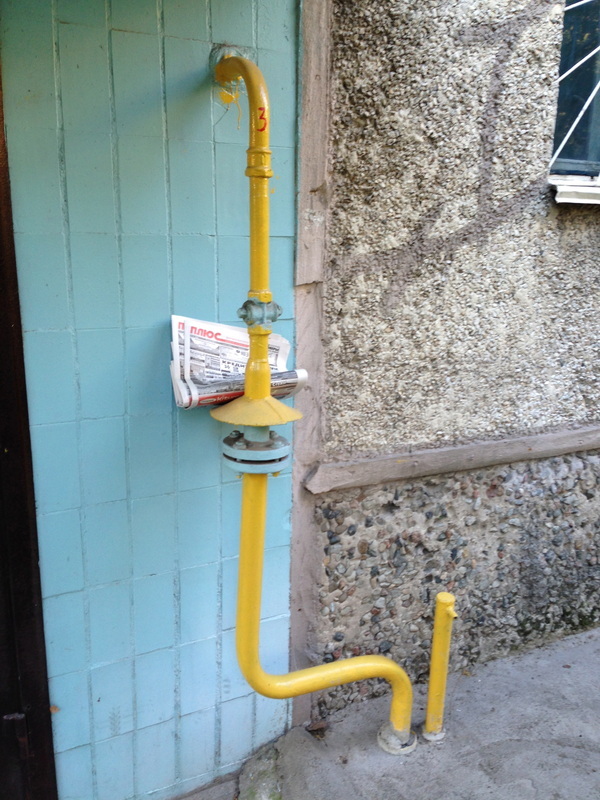 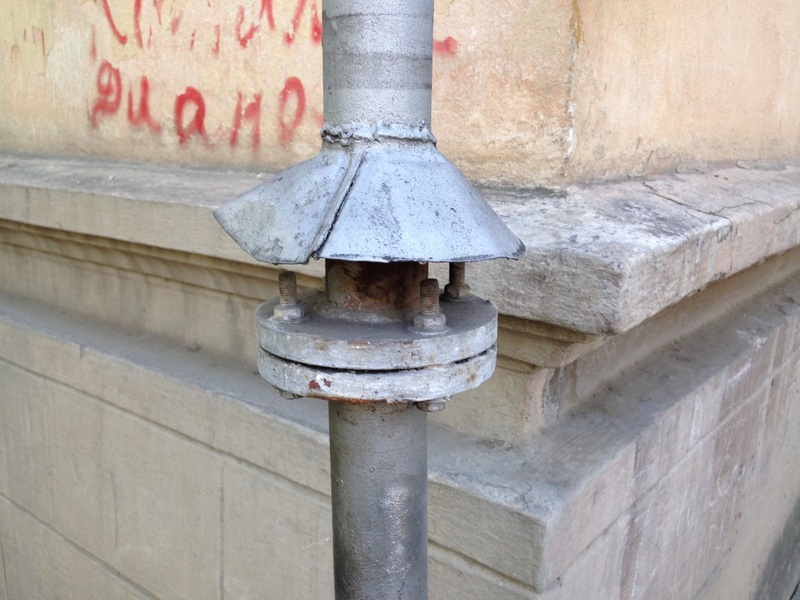 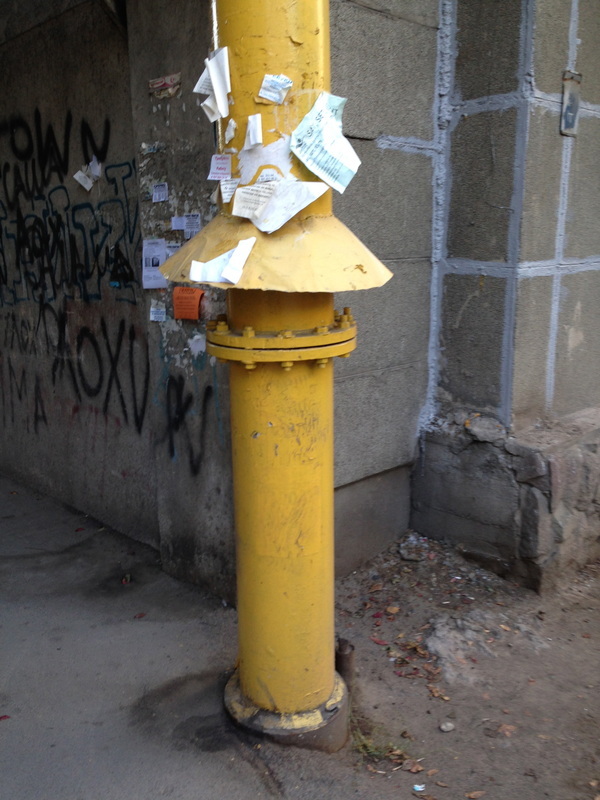 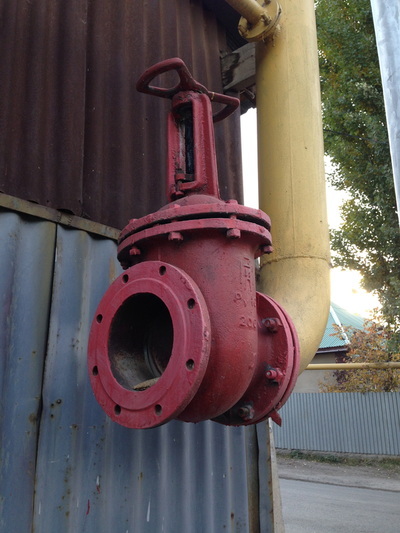 Sometimes, in the case of maintenance or an emergency, you have to stop the gas altogether, which is why there are gate valves [задвижки; zadvizhki] along the way. 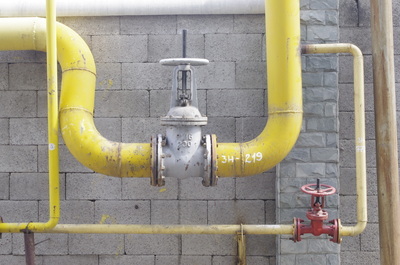 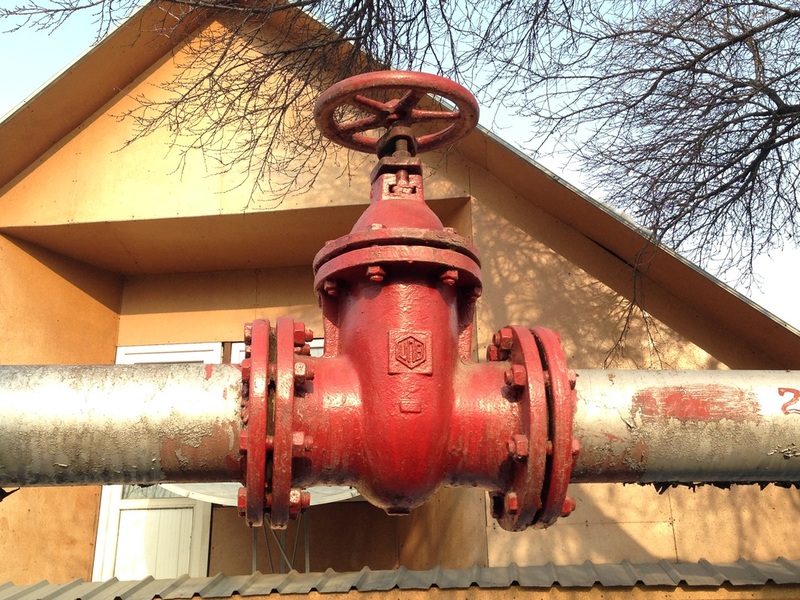 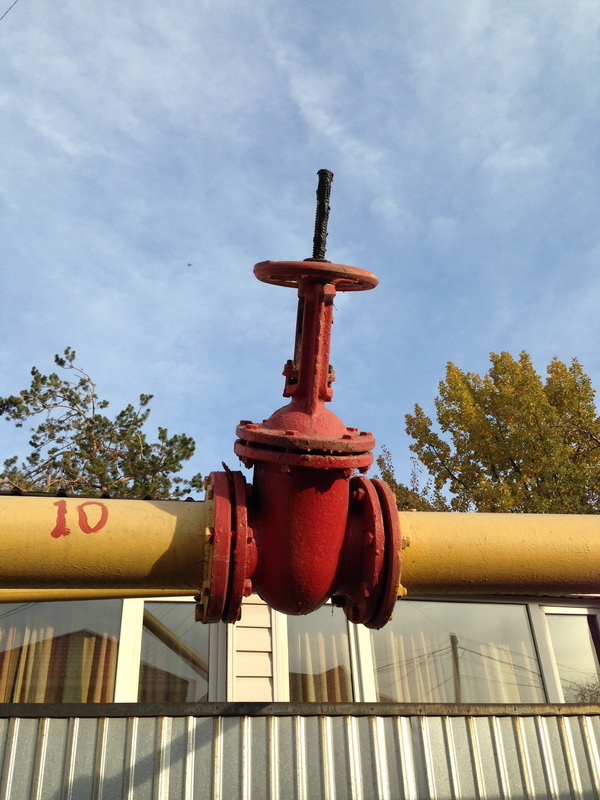 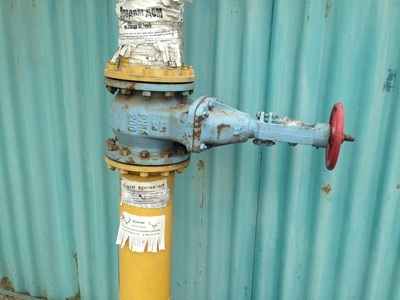 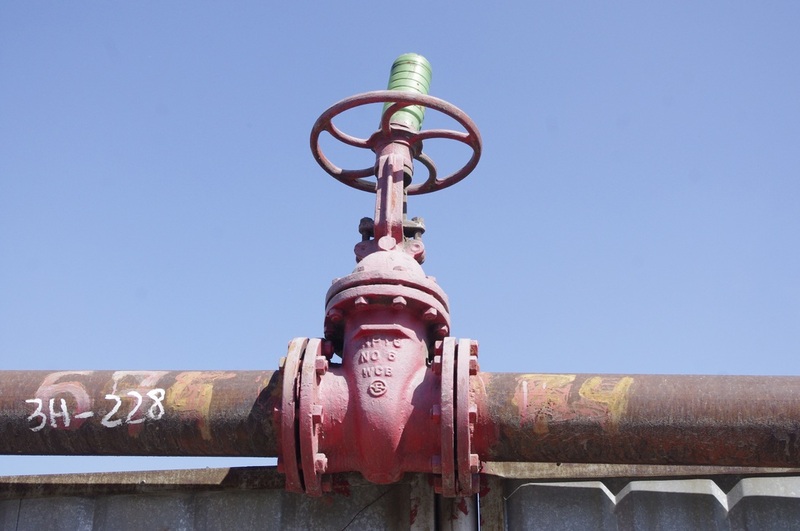 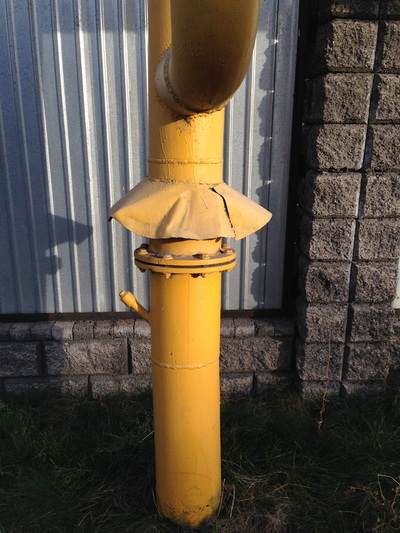 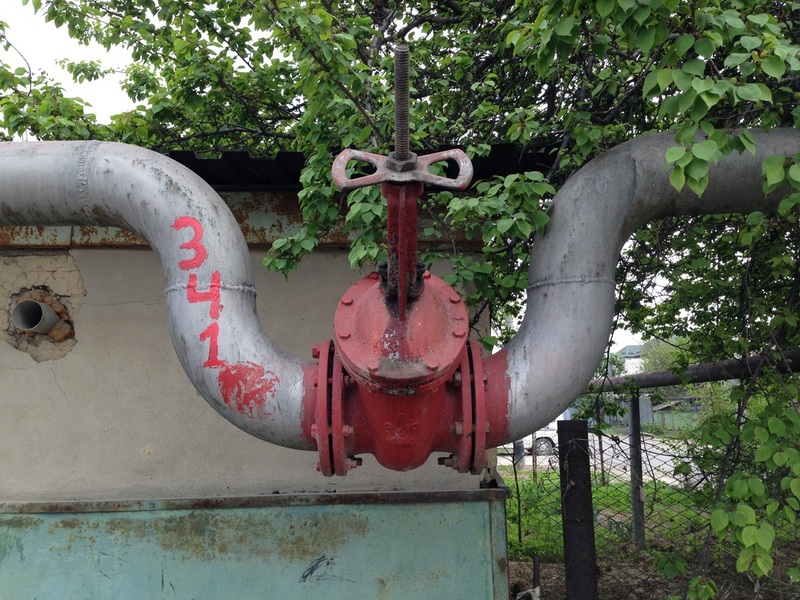 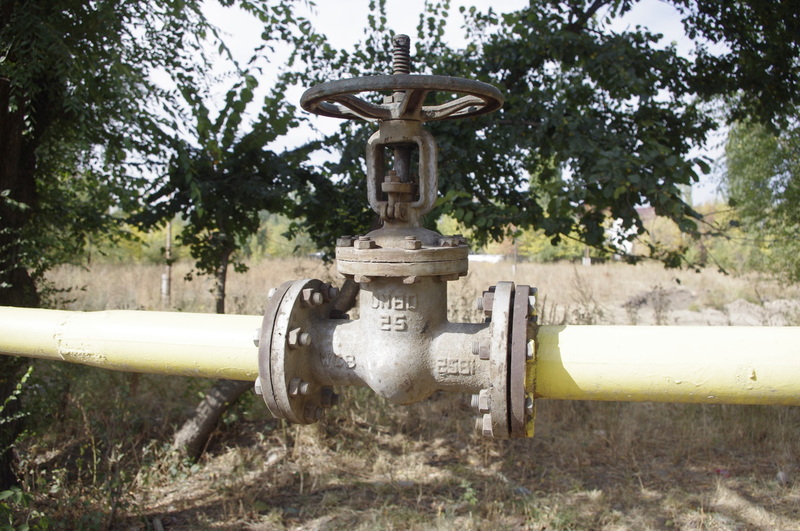 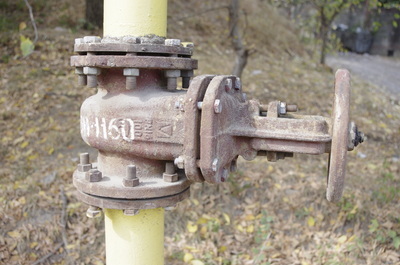 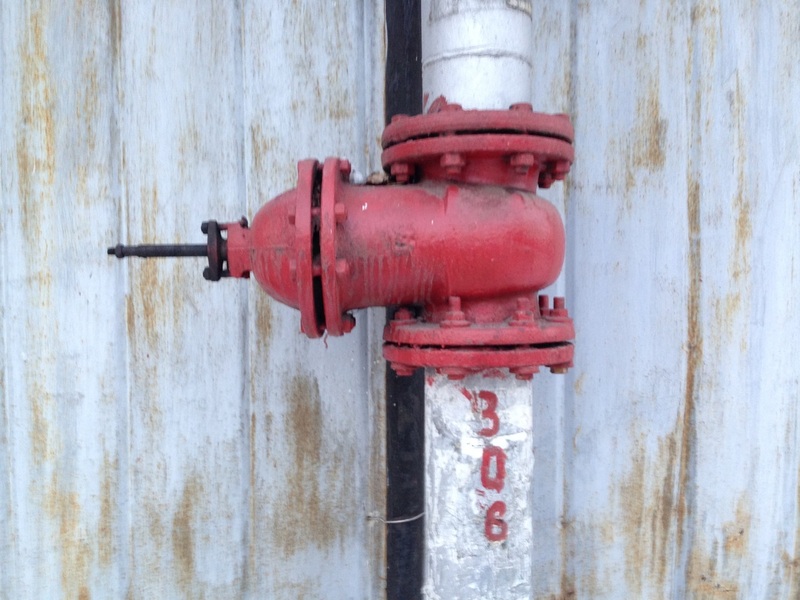 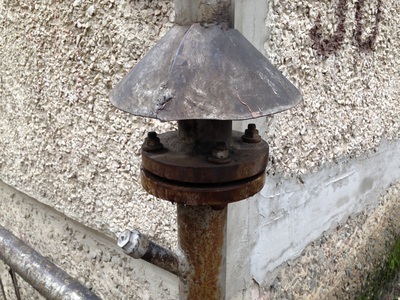 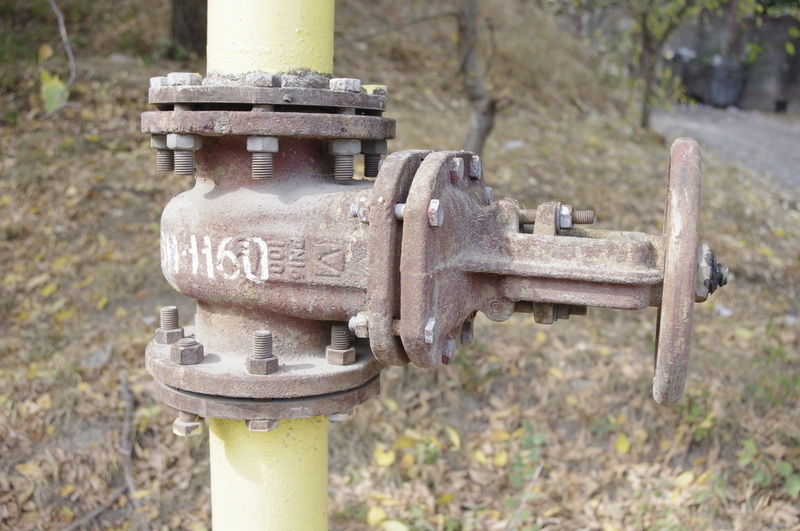 Gate valves are everywhere and give the pipelines a lot of their character. They're big hunks of metal and bolts, with "handwheels" that can be turned to open or plug the pipe. 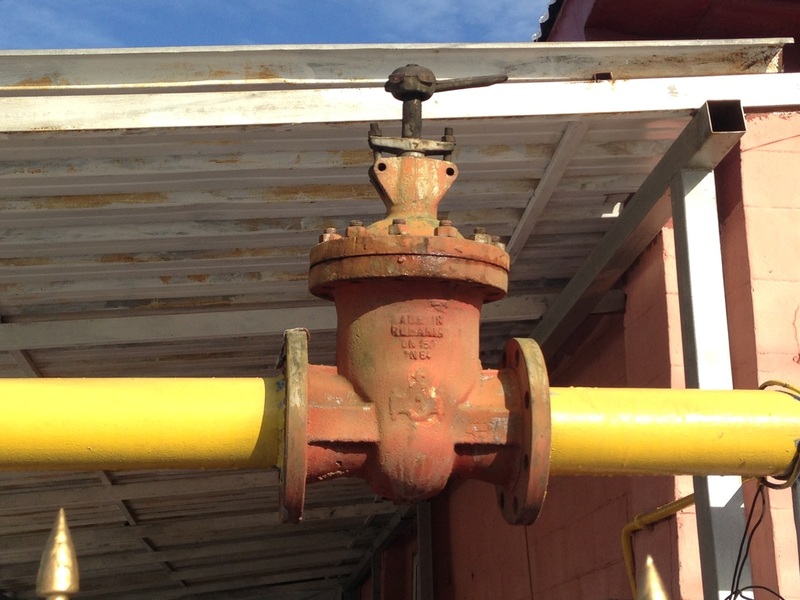 To me, these gate valves always seem too conspicuous to be safe. 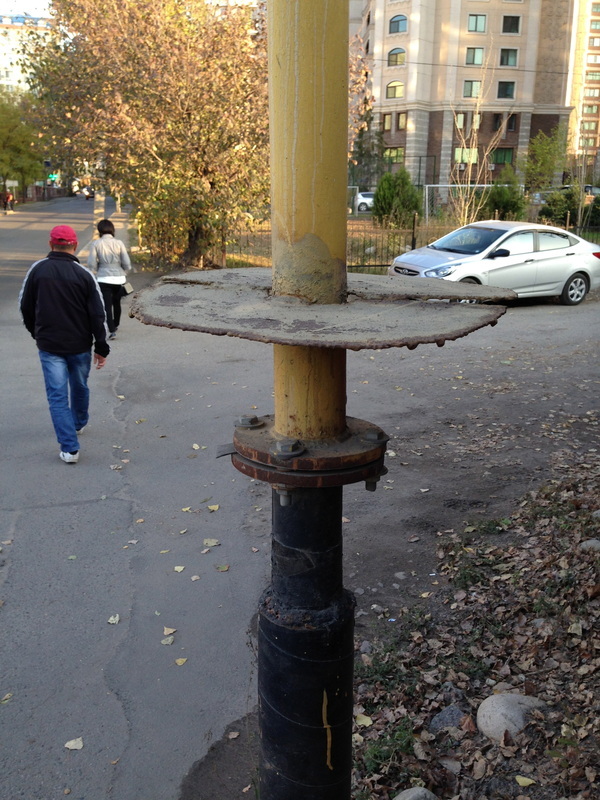 Can't some kid just come up and crank the wheel, screwing up his whole neighborhood?